When planning Mangrove Cay Club over 13 years ago, we gave careful thought and attention to all of the minute details of our facility and operation. 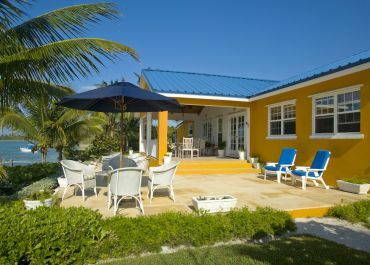 Mangrove Cay Club was designed to raise the bar on the level of comfort offered by a bonefishing lodge. We believe we have achieved our vision of “having it all”. The best access to an amazing fishery, a beautiful setting, comfortable accommodations, excellent food, attentive staff, professional guides, equipment that works and hands on management. We started with virgin coppice on rocky ground and built the road to take us to our waterfront property. We cleared space for the buildings but left most of the natural vegetation. We built four spacious duplex cottages designed for privacy and minimal intrusion from neighbors and a main lodge designed for conviviality. All of the buildings are divided by a thick growth of trees and shrubs for privacy, connected by pathways and surrounded by meticulously landscaped lawns and flowerbeds. 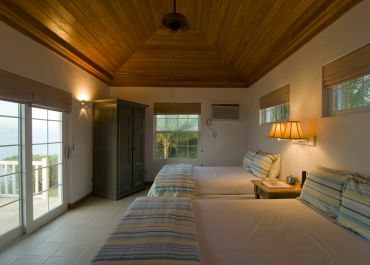 Each of the four bungalows is divided into two suites, separated by a thick soundproof wall. The eight suites all have high cypress ceilings and a bedroom, a sitting room, an oversized bathroom and a private porch overlooking the Middle Bight. 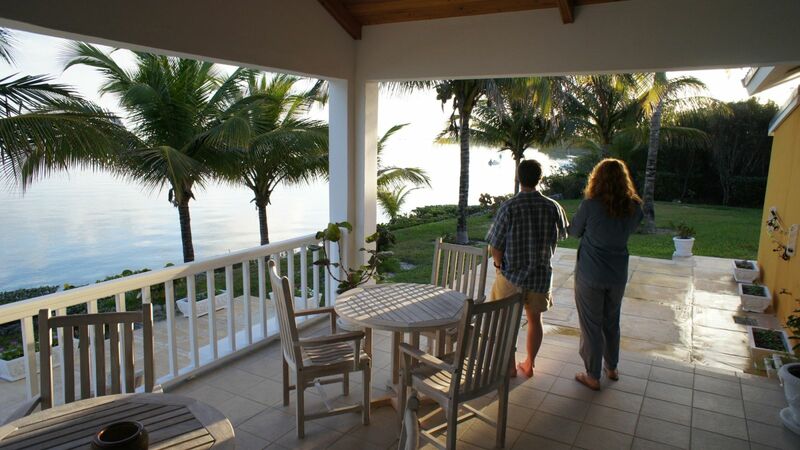 Access to the porch is through sliding glass doors from the bedroom, where two queen size beds face the sea. We can accommodate a maximum of 16 guests, a comfortable number to ensure high quality service and management’s personal attention. It is a short walk to the main lodge. As you enter through the front door, there is a small shop and office to the right. Here you will find telephones and a laptop computer with wireless high speed Internet for your use. The rest of the lodge is open with a large bar and sitting area at one end and the dining area and entrance to the kitchen at the other. There are also bathroom facilities for men and women. The dining area opens out on to a large veranda overlooking Middle Bight followed by a few steps down to the patios and a few more steps down to the attractive wooden dock. This dock is where guests are picked up by our guides each morning and dropped off in the afternoon, and where many evenings are spent fishing for sharks. At the west end of the property there is a small sand beach at the end of a seawall built of native limestone. A jetty, also built of native limestone is the best place on our property to practice a few casts. The chairs and lounges in the thatch roof gazebo at the other end of the seawall is the place to watch the spectacular sunset at the end of a day of adventure. 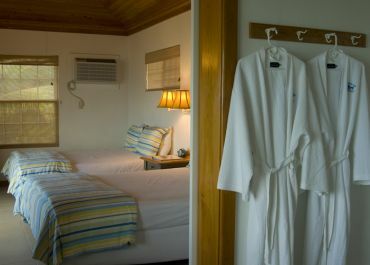 The lodge is one of the finest facilities in the Bahamas and is immaculately maintained by Liz and Alton Bain. They are part owners of the operation and their attention to detail is evident throughout the property. It is a wonderful place to relax after a great day on the water. 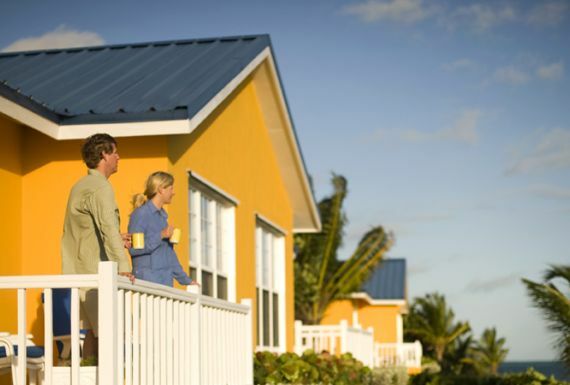 When we built Mangrove Cay, our goal was to set the standard for comfort for a bonefishing lodge in the Bahamas. Our eight suites sit within 4 large bungalows spread out along the shore, screened from each other by a lush growth of trees. All are a short walk on a sand path to the main lodge. A private porch overlooking the ocean. On the outside wall of each suite is a rod rack that will hold four rods, a bucket for soaking reels and a convenient freshwater hose for washing rods and all other equipment each day. Both outside and inside the entrance are hooks for wet clothes and gear. The sitting room is furnished with a sofa and chair and some small tables providing the space for laying out tackle and equipment. Fresh ice and bottled drinking water are placed in your suite each day. Each bathroom has its own 40 gallon water heater so there is never a shortage of hot water. The bathroom has lots of shelf, counter and hanging space and a very large walk-in shower with shelving for shampoos, razors, etc. We provide abundant towels, waffle weave bathrobes, shampoo, conditioner, body wash, bath soaps, hair dryer and bug spray. The air conditioned bedroom is off of the sitting room through double sliding doors and contains a bureau, a wardrobe, a night table and two queen size beds facing the sea. There are sliding doors from the bedroom out to the porch and padded lounge chairs. You can greet the day and check out the weather without seeing another guest or having to get dressed. 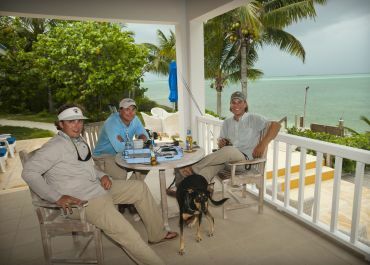 For too long, bonefishing in the Bahamas has required spartan accommodations. Mangrove has changed that. 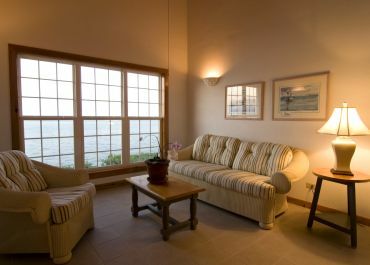 Our lodging is very comfortable and allows you plenty of privacy and comfort during the non-fishing hours of your stay.